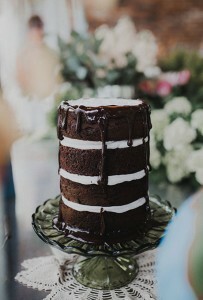 This four-tier cake is made with gorgeous layers of dark chocolate cake and striking white icing in between the layers. But that chocolate glaze on top? That’s what makes this my new favorite non-iced cake. It looks like a giant snack cake all dressed up for a wedding. And that’s OK with me. Your guests will love this confection too. You’ll find this chocolate cake here.